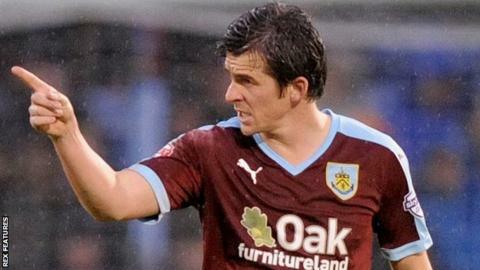 Burnley midfielder Joey Barton believes there is more pressure on promotion rivals Middlesbrough, Derby and Hull because they have higher wage bills. The Clarets lie in fourth place in the Championship, four points outside the automatic promotion places. "We're aware of the spending power of clubs. Boro are spending a lot more than us, Derby doing the same and Hull. "We've got pressure internally from ourselves, our own internal standard, but there's a long way until May." The 33-year-old believes that there is less expectation at Turf Moor, because they have not spent as much on wages. "If you probably look at the salaries within those three clubs it's probably a lot bigger than ours so there's a lot more pressure on them," he told BBC Radio Lancashire. "Middlesbrough have pulled away at the top, Hull have done fantastically well and Derby, so it's important that we stay in that group." Barton still believes he can perform at a high level and admits he was part of a poor team at Queens Park Rangers last season. "I thought I was really good last year even though QPR got relegated. The reality of it is I was in a really poor team but my own professional standard was sky high. "Sometimes you are only good as the players around you and I think that's what enabled me to turn in performances I'm playing with some really good players."